Personally, I think Dr Brown is largely missing the boat on this one: I don’t hear anybody preaching FOR what he’s preaching against, though they’re probably out there somewhere, if you look hard enough. But if you can eat the meat and spit out the bones, you will likely find a good foundation for Grace here. At a time when the church needs an urgent wake-up call and a fresh encounter with Jesus, the hyper-grace message is lulling many to sleep. Claiming to be a new revelation of grace, this teaching is gaining in popularity, but is it true? Or is the glorious truth of grace being polluted by errors, leading to backsliding, compromise, and even the abandonment of faith? Hyper-Grace looks at the major teachings put forth by many adherents of this “grace reformation” and prayerfully compares those teachings with the Word of God. Without watering down the Bible’s true message of grace, Michael Brown gives you the facts, demonstrating the dangers of this seductive message and showing you how to keep from being taken in. From a 5-star review: “Dr. 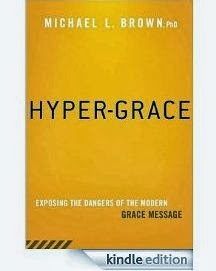 Michael Brown's Hyper-Grace: Exposing the Dangers of the Modern Grace Message is a much needed response to the deluge of popular new grace theology in the church today. In a respectful but emphatic tone Dr. Brown interacts with a large variety of popular "grace movement" teachers and doctrines, highlighting both liberating truth and destructive error. Hyper-Grace carries out a systematic examination, asking difficult questions, examining a wealth of scriptural interpretation, and thoroughly interacting with the main tenets of new "grace theology" in a clear and engaging way. The table of contents alone posits questions that both "grace teachers" and those examining their theology need to answer: "Has God Already Forgiven our Future Sins?" "Should Believers Confess their Sins to God?" "[Are we]Sanctified or Not?" "Is Spirituality Effortless?" "Is God Always in a Good Mood?" "Why are we Running from the Words of Jesus?" Dr. Brown's chapters also ask if the Holy Spirit convicts unbelievers and/or believers of sin and if so should we repent? and what does that mean? From a 1-star review: “One thing I'll give Mr. Brown credit for is that he brings attention to the gospel of grace and calls for clarification. His book is based on a fundamental flaw in teaching. In a nutshell, he's saying, "Look at these people who are walking in the flesh. This proves the grace message (aka hyper-grace) is flawed." Fleshly minded people are trying to use grace for their own means? Should that be a shock? Fleshly minded people have always used the Bible for their own means. Every politician becomes a `Christian' during political season. The airways are filled with people peddling the gospel for profit. Even atheists quote the Bible when it suits their own purposes. Comment: I observe that the vast majority of Dr Brown’s recent books are about what he’s against. That much negativity, even with the best of intentions, cannot help but pollute the mind: the more you look for what you disagree with, the more you find, and the more you empower. For contrasting view on the topic, consider Hyper-Grace, the Dangerous Doctrine of a Happy God.